“Sinking of a hostile armed troop carrier by German submarine in the Mediterranean sea,” 1917. Painting by German artist Willy Stöwer (1864–1931), reproduced on a postcard printed during the war. Image from Wikimedia Commons. On January 27 Mencken left Berlin to visit the German-Russian front along the Dvina River in the northeast Lithuanian province of Vilna. Mencken biographer Marion Elizabeth Rodgers summarizes his reports: “There could be no doubt among Sun readers that ‘Herr Mencken’ not only was impressed by the German army but had also enjoyed himself.” He returned to Berlin on January 31 but was unable to revisit the front after the Kaiser announced a campaign of “unrestricted” submarine attacks against British shipping—an act that threatened the already strained relationship between the United States and Germany. On February 4 Mencken and his fellow reporters received word that, in fact, the United States had severed diplomatic relations with Germany, and they immediately realized their days in the country were numbered. The German-American dispute over submarine warfare had been simmering for over two years. 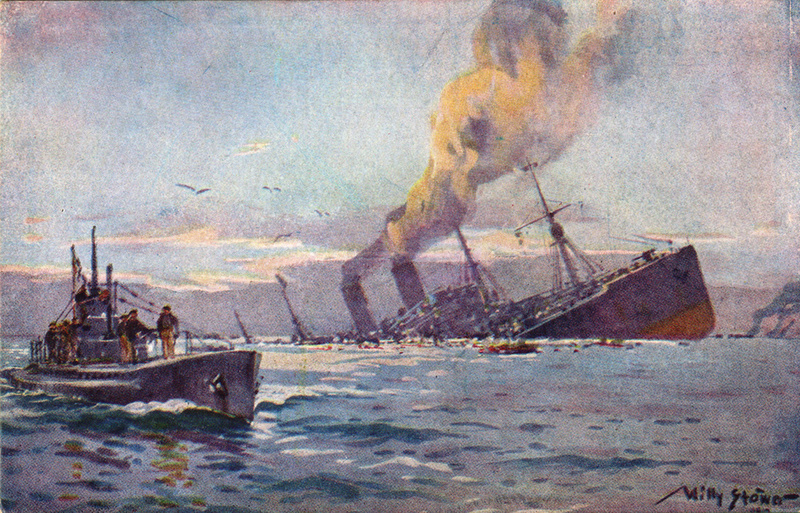 In February 1915 the United States warned Germany that sinking American ships, or ships carrying American passengers, would be considered “an indefensible violation of neutral rights.” In subsequent months American patience was seriously tested in a series of attacks on passenger ships, including, most famously, the sinking of the Lusitania on May 7, which killed 1,198 people (including 128 Americans). In August, hoping to placate the U.S. government, the Germans suspended its unrestricted U-boat campaign, but the following March the French passenger ship Sussex was torpedoed, injuring several Americans. Wilson warned Germany that the U.S. would break diplomatic relations if attacks on passenger ships continued, and the Germans again pledged to abide by the established rules of naval warfare. At the end of 1916, however, Henning von Holtzendorff, the chief of the German naval staff, sent to General Paul von Hindenburg a secret memorandum, in which he projected that an unrestricted U-boat campaign would force Britain to sue for peace after five months. The allure of the quick victory promised in the memo—miscalculated as it proved to be—was too tempting. On February 1, 1917, the day after his return to Berlin, Mencken wrote a detailed journal entry that became “Berlin at Time of Break,” the first of a series of articles published by the Sun the next month under the rubric “The Diary of a Retreat,” a chronicle of his flight from Europe. 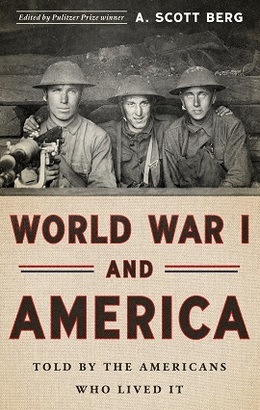 This initial installment has been included in the latest Library of America volume World War I and America: Told by the Americans Who Lived It, edited by Pulitzer Prize–winning author A. Scott Berg, and—on the centennial of the crisis, which led two months later to the American entry into the war—we present it below as our Story of the Week selection. Notes: Mencken sprinkles a few references in his story that would have been familiar to most of his newspaper readers who had been following the war. On the first page he mentions Johann Heinrich von Bernstorff, the German ambassador to the United States from 1908 to 1917. On the following page: Gamaschen are leggings, and Die Berliner Lokal-Anzeiger was a daily German newspaper. On page 284: The term Feldgrau refers to German soldiers (from “field gray,” the color of the German uniform), and the rumor mentioned by Mencken, that General Erich von Falkenhayn’s forces were on the Danish frontier, turned out to be false. North German Lloyd was a German shipping company. The last sections of the article include interviews with Conrad Roediger, who worked for the German foreign ministry, and Fritz Thiel, the chief of the German information service. The final paragraph refers to James Watson Gerard, the American ambassador to Germany. Across the front page of the Tageblatt this morning ran the long-awaited, hat-in-the-ring-throwing, much-pother-throughout-the-world-up-stirring headline: Verkündung des uneingeschränkten U-Boot-Krieges!—Proclamation of the Unrestrained U-Boat War! . . . If you don't see the full selection below, click here (PDF) or click here (Google Docs) to read it—free!